What caused this? Students are presented with descriptions of situations and asked to explain possible causes. What might happen? Students are presented with descriptions of situations and asked to state possible consequences. Finish the sentence. Students are asked to finish incomplete sentences by stating possible consequences. Short Story Worksheets. The stories in this section are each followed by questions that require students to describe causes and consequences relating to the story events. Picture Story Challenge. 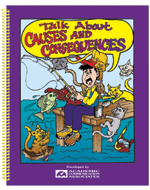 After listening to an incomplete story, students are asked questions relating to causes and consequences. Each story is accompanied by a picture. A downloadable edition of this book is also available. Select the RELATED PRODUCT link below to view.